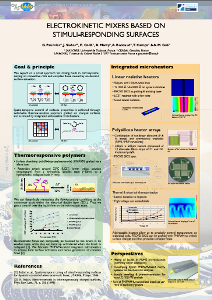 I recently attended the MicroTAS conference in Paris, France, where I presented a poster entitled Electrokinetic mixers based on stimuli-responding surfaces. I was also the official photographer for the conference. "MicroTAS" (also written "µTAS") stands for "Micro Total Analysis Systems", a subset of the field of labs-on-chips that specializes in the analysis of total (unprocessed) samples, like a drop of blood. 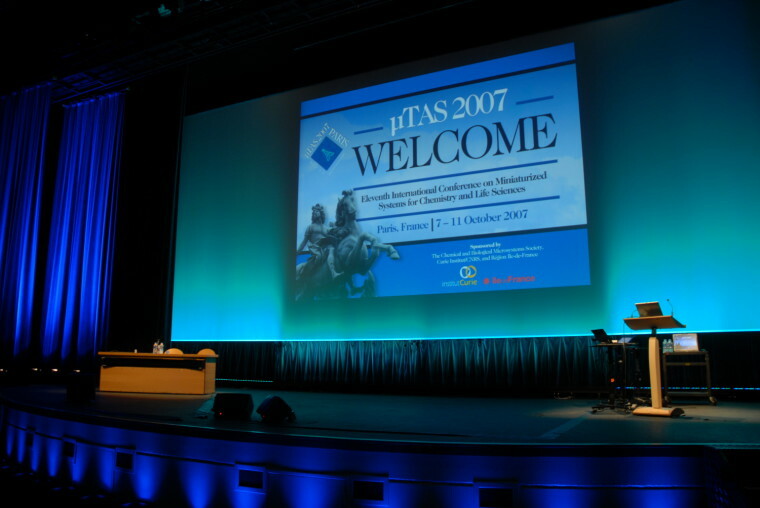 MicroTAS (the conference), as its name does not indicate, is the International conference on biomedical electronics and devices. It's one of the major conferences in the field of labs-on-chip, and we were thrilled to have a paper accepted, even if it was "just" for a poster. Most (if not all) of my colleagues use PowerPoint to make their posters. Besides the fact that it is a proprietary and expensive software, it also remains a presentation program suited for, well, presentations. A poster is not a presentation, and there are more suited tools than presentation programs, such as desktop publishing programs. I have been using an open source desktop publishing software called Scribus, for some time now and I just love it. Scribus supports layered elements, has an awesome color management system and offers a PDF export feature of outstanding quality; it even supported PDF/X-3 export before any other (proprietary) software. Posters sessions are usually quite dull. The presenters often forget that researchers who attend a conference have very little time to devote to the posters. I decided to come up with an original design to attract visitors who would then learn about my research & results. My poster was about a new way to generate waves in microchannels using polymer-based mixers. 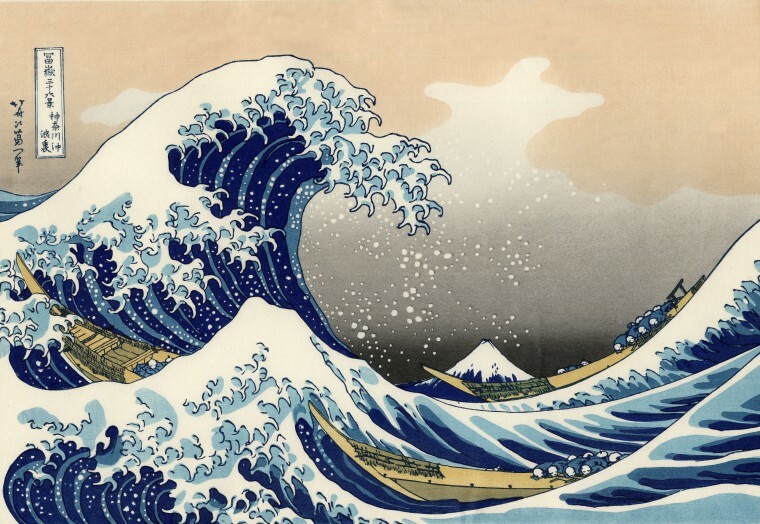 I looked up in the "Waves" category on Wikimedia Commons, the free media repository, and I stumbled upon this old Japanese painting called The Great Wave off Kanagawa. I found a high-resolution, high-quality copy that I used as background image for my A0 poster. Needless to say, my poster got much more attention than its neighbors. Researchers from Asia were particularly excited about it, and they represented a large part of the audience. You can catch more flies with honey than with vinegar, says the English idiom. It is also true for scientific communication: you can catch more attention from researchers with original, attractive documents than with boring, poorly-designed ones. The high-resolution PDF version of the poster is now available for download. Some PDF viewers may have some trouble displaying this file, because it uses transparency and layers. I recommend using the latest version of Adobe Reader. Except for the top logos & header, the whole poster is released under a Creative Commons Attribution ShareAlike license, which means you are free to use it, modify it, redistribute it for any purpose as long as you appropriately attribute it to me, and that you distribute any derivative works under the same license.